Many avid riders have the ideal saddle pictured in their mind but can't find exactly what they want. Crest Ridge Saddlery can finally make that dreamed for saddle a reality by building a custom saddle for your horse or mule. You don't have to compromise your desires, nor do we compromise on quality. Our saddles work equally well for stock, gaited and draft horse breeds. Best of all, you'll be pleasantly surprised how affordable it is to have your custom horse or mule saddle built by Crest Ridge Saddlery. To have a custom saddle built,call or e-mail Debra who will work through all of the details with you. She begins by having you measure your horse to determine the saddle tree bars and seat size that fits best. Then the real fun begins! Style: Western, Plantation, Endurance or a combination. Rigging: Western, Sam Staggs, English, center-fire, or a combination along with custom placement of the rigging rings. Seat style: SupraCor, suede, slick, Cheyenne rolls, bucking rolls, pommel style, cantle style, full seats, and 3/4 seats. Skirts: Western, Plantation, leather, synthetic. Fenders: leather, synthetic, English stirrup leathers, California fenders. Stirrups: Western, endurance, tapaderos, English and Monkey Nose. Leather work: braiding, tooling, custom pouches and bags, stitching. 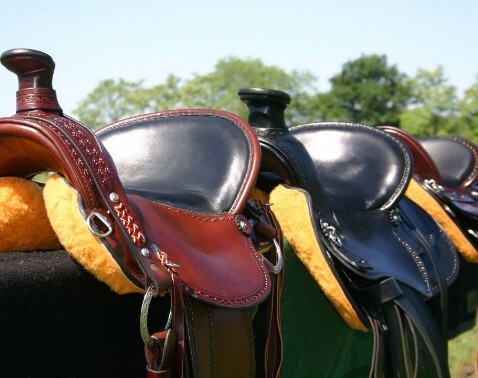 All custom saddles carry our standard warranty but might not be returnable. Debra will tell you, before you order, if your saddle will be returnable.